- Now Featuring 5 Premium Cards Per Box With an Even More Spectacular Design! 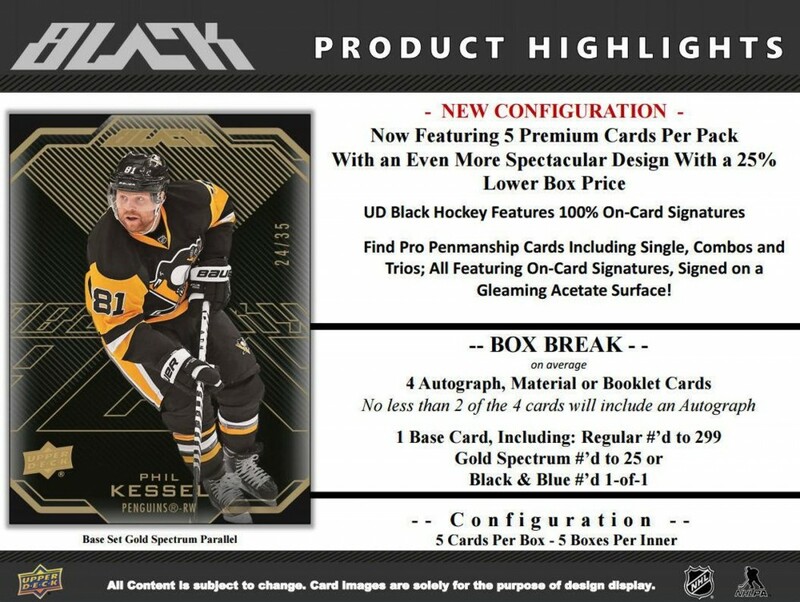 - UD Black Hockey Features 100% On-Card Signatures! 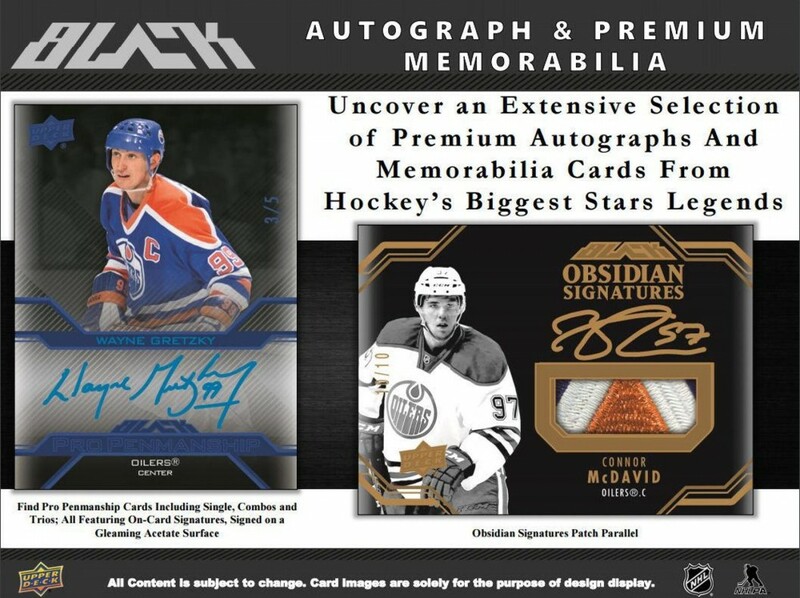 - Grab Two Autographs Per Box! - Featuring The Spectacular Lustrous Rookies Signature Cards! 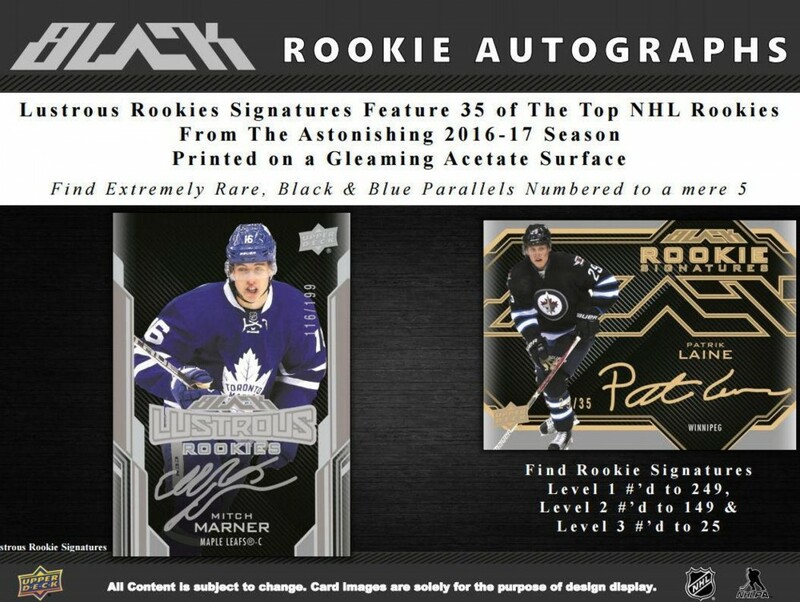 - Featuring 35 Top NHL Rookie Stars From The Astonishing 2016-17 Season Printed on a Gleaming Acetate Surface! - Find Extremely Rare, Black & Blue Parallels Numbered to 5! - New! Look For Color Coded Autographs And Auto-Jersey Cards Featuring Some of The Most Stunning On-Card Autographs of The Year! - New! 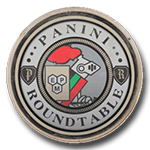 Find Black Hole Relics and Premium Relic Cards Including Autographed Parallels of NHL's top Rookies, Stars and Legends! - These Stimulating Inserts Will Have Collectors Begging For More! - Find Pro Penmanship Cards Including Single, Combos and Trios; All Featuring On-Card Signatures, Signed on a Gleaming Acetate Surface! - Star Trademarks & Rookie Trademarks Inserts Deliver an Array of Oversized Jersey And Patch Cards! - Including Autographed Versions #'d as Low as 5 Copies Per!